Largest Welsh Cake .. it's a world record ! For more information see links below images. St. David’s Day (2014), or Dydd Gŵyl Dewi in Welsh, was a day of celebration in the town of Bala, North Wales, organised by Bala and Penllyn Tourism Association. The highlight of the day was the World Record attempt of making the largest Welsh Cake in the World! The consistency of the mix, the rolling to size and then the cooking all came together on the day to meet the criteria of the Guinness Book of Records of a 20kg cake. The cooked weight was 21.7kg and the diameter was 1.5 metres! Guinness World Records have confirmed that its a World Record - the largest Welsh Cake in the World was made in Bala. 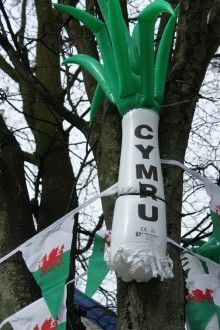 The town began celebrating on Friday as local businesses competed by decorating the 25 trees lining the High Street in the colours of the Welsh flag. Shop windows were dressed and flags were hung, it was a glorious spectacle. There was a buzz of expectation for the following day, March 1st, to celebrate Dydd Gŵyl Dewi. The children loved the Circus Workshop, the Magician and the storytelling. There were smiling faces from adults and children alike as families rushed around the town to see; the world famous Choir ‘Cor Godre’r Aran’, to follow the Tegi Bach Treasure Hunt (the friendly Lake Monster), buy produce from Snowdonia Market and local artisan craft stalls, whilst enjoying an historic Town Trail and having their faces painted en route. Everyone wearing their daffodils, some wearing Welsh costume, and smiling broadly. The cooking of the Welsh Cake drew a huge crowd and there was a rush to buy a piece of the Biggest Welsh Cake in the World. There were a few tense moments as the team of cooks rolled the cake to the correct depth and then cooked the cake over very hot coals. The temperature was monitored and the cake was twisted and turned to cook evenly. Then came the flip and in came the team to lift the metal plates with the 3 stone Welsh Cake in the middle! There was a roar from the crowd as the flip was successful and a cheer of joy when the top came off and the cake was perfectly browned! The whole cake, over 200 pieces, sold like hotcakes, including off-cuts and crumbs, within 15 minutes! Comments included “this is the best welsh cake I’ve ever eaten”. The day ended with prize giving and the local school children leading the crowd with several well-known Welsh songs. Treasurer, Webmaster, Dogsbody: Ray Hind. Rolling the largest Welsh Cake in the World!